Washington, DC – The National LGBT Chamber of Commerce (NGLCC), the business voice of the LGBT community celebrated members of the LGBT and allied business community during the 2018 NGLCC Awards Gala Dinner, held in Washington, D.C. on Friday, November 16. IBM and Aetna served as presenting sponsors of the gala, hosted at the National Building Museum. The 2018 Awards Gala brought together hundreds of LGBT business owners, corporate diversity leaders, elected officials, and representatives from NGLCC Global international affiliates from around the world for an evening of celebration. The gala also marked the culmination of the third annual NGLCC Global LGBTI Business Week, sponsored by Accenture -- a summit focused on global LGBTI economic development and human rights through promoting LGBTI business empowerment and inclusion. 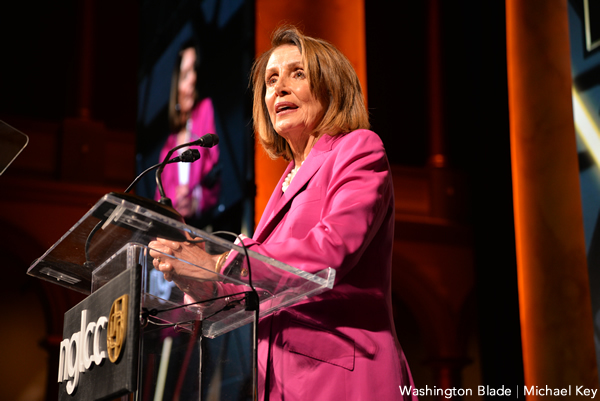 House Democrartic Leader Nancy Pelosi was a surprised guest at the Gala, reaffirming her support to the LGBT community. “We are proud that so many new LGBTQ members…represent every corner of our country,” she added. “LGBTQ members look like America: They’re mothers, business owners, people of color and members of the native nations.” Pelosi spoke hours after Justin Nelson and Chance Mitchell — co-founders of NGLCC — and more than 100 other leading LGBT advovates endorsed her for speaker. 2018 marks the 28th year that Bank of America has had a formal corporate supplier diversity program, and in that time, they have spent more than twenty billion dollars with diverse businesses. From leadership roles on NGLCC councils, to mentoring dozens of suppliers, to opening their doors across the country for LGBTBE education programs with NGLCC affiliates, Bank of America has been a visible, steadfast leader in supporting the LGBT business community. Todd Rice is a champion for LGBTBEs, serving on the Certification Committee and representing American Airlines at countless NGLCC council meetings and special events. Todd has coached nearly a dozen LGBTBEs in the NGLCC Mentorship program, galvanized local leaders to work closely with our affiliates, and helped push the entire airline industry forward toward greater LGBT inclusion. Heels and Hardhats Contracting Corp. was formed in 2010 when Jackie Richter, a general manager of a construction company, suddenly couldn’t find work following her transition. Jackie and her partner Cyndi formed Heels & Hardhats with a mission to train, promote and utilize greater diversity in the construction trades. They are a 100% woman-owned company that embodies inclusion at their very core and have become an essential pillar of NGLCC’s Construction & Related Industries Council. The Miami-Dade Gay & Lesbian Chamber of Commerce is the among the largest LGBT chambers in the affiliate network, with nearly 700 members and a growing list of Miami’s largest LGBT-inclusive corporations. In 2019, the Miami-Dade chamber will be celebrating 20 years of serving their community and elevating the diverse businesses voices in their region. Beth Brooke-Marciniak is the Global Vice Chair of Public Policy for EY, and is the global sponsor for their diversity and inclusiveness efforts, serving more than 260,000 people in over 150 countries. Since coming out in a company-wide ‘It Gets Better’ video in 2011, Beth has leveraged her global platform to champion LGBT and women’s issues. Beth has been named to Forbes World’s 100 Most Powerful Women list ten times. Additionally, NGLCC awarded the NGLCC/American Airlines ExtrAA Mile Award to the transgender community, represented onstage by trans business owners and Mara Keisling, Founder & Executive Director of the National Center for Transgender Equality (NCTE). NCTE was presented with a check for $25,000 as part of a new joint initiative with NGLCC to foster economic strength and entrepreneurship in the trans community. Check NGLCC's Flickr page for photos from the 2018 National Dinner in the weeks ahead and view the 2018 In Review video debuted at the 2018 NGLCC Awards Gala below.